WASHINGTON (Reuters) - A top aide to President-elect Donald Trump said in an interview aired on Sunday that the White House may have disproportionately punished Russia by ordering the expulsion of 35 suspected Russian spies. 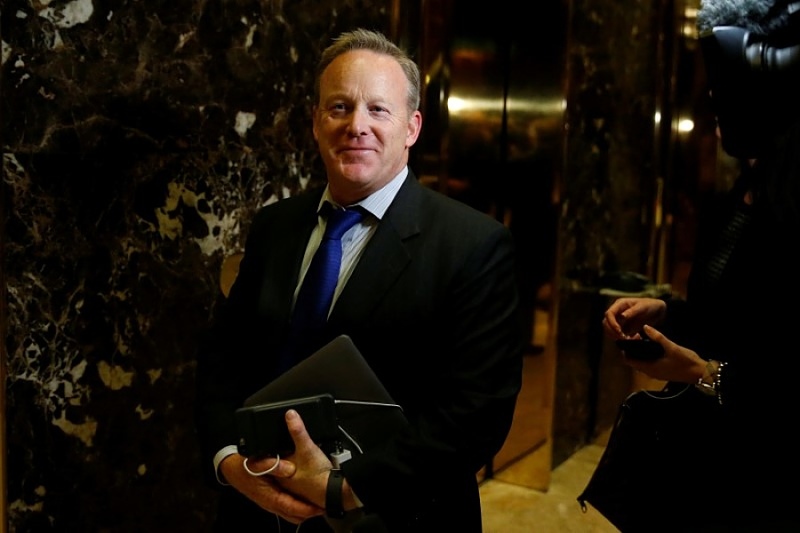 Incoming White House press secretary Sean Spicer said on ABC's "This Week" that Trump will be asking questions of U.S. intelligence agencies after President Barack Obama imposed sanctions last week on two Russian intelligence agencies over what he said was their involvement in hacking political groups in the 2016 U.S. presidential election. Obama also ordered Russia to vacate two U.S. facilities as part of the tough sanctions on Russia. "One of the questions that we have is why the magnitude of this? I mean you look at 35 people being expelled, two sites being closed down, the question is, is that response in proportion to the actions taken? Maybe it was; maybe it wasn't but you have to think about that," Spicer said. Trump is to have briefings with intelligence agencies this week after he returns to New York on Sunday. On Saturday, Trump expressed continued skepticism over whether Russia was responsible for computer hacks of Democratic Party officials. "I think it's unfair if we don't know. It could be somebody else. I also know things that other people don't know so we cannot be sure," Trump said. He said he would disclose some information on the issue on Tuesday or Wednesday, without elaborating. It is unclear if, upon taking office on Jan. 20, he would seek to roll back Obama's actions, which mark a post-Cold War low in U.S.-Russian ties. Spicer said that after China in 2015 seized records of U.S. government employees "no action publicly was taken. Nothing, nothing was taken when millions of people had their private information, including information on security clearances that was shared. Not one thing happened." "So there is a question about whether there's a political retribution here versus a diplomatic response," he added. U.S. intelligence agencies say Russia was behind hacks into Democratic Party organizations and operatives before the presidential election. Moscow denies this. U.S. intelligence officials say the Russian cyber attacks aimed to help Trump defeat Democrat Hillary Clinton. Republican John McCain, chairman of the Senate Armed Services Committee, has scheduled a hearing for Thursday on foreign cyber threats and has said that Russia must be made to pay the price for attacks "on our very fundamentals of democracy. The top Democrat on the House Intelligence Committee said on the same ABC program that Congress would push for an even harsher reprisal against Russia and warned Trump against undoing Obama's sanctions. "We think that more has to be done. We don't think that frankly, the steps that have been taken are enough of a deterrent," said Representative Adam Schiff, a California Democrat. â€œAnd you're going to see bipartisan support in Congress for stronger sanctions against Russia." Senator Tom Cotton, a Republican from Arkansas, said on "Fox News Sunday" that Obama's sanctions were not enough. Russian President Vladimir Putin decided not to expel anyone in retaliation, saying he would consider the actions of Trump when deciding on further steps. Trump, who has repeatedly praised Putin, said the Russian leader was "very smart" for holding back. Russian diplomats who were expelled by Obama left Washington on Sunday, Russian news agencies reported, citing Russia's embassy.